It was used by Indians to treat health conditions such as fatigue and anemia while Romans relied on its immense ability to retain sexual health. Regardless of its use, one thing’s for sure; the beetroot is a root that every household needs. Beetroots contain plenty of manganese and folic acid. The green leaves are rich in vitamins such as vitamin A (127% of RDA), C (50% of RDA), K (500% of RDA) as well as mineral such as magnesium, iron, calcium, potassium, copper, silica, choline and sulfur. Benefits of beet juice are powerful. Read on to get more detailed information. Following are some health benefits of beet juice. Although these may be lack of enough scientific proof, people still use beet juice as a home remedy for overall health. Beet juice contains oxalic acid (raw), which is an excellent diluent of inorganic calcium residues in your body. These inorganic calcium residues have been associated with several chronic diseases such as arthritis, arteriosclerosis, eye problems, heart disease and kidney stones. According to research, beet juice helps prevent different types of cancer such as leukemia, colon, skin, lung, liver, breast, prostate cancer, etc. Beet juice contains betacyanin which not only detoxifies the body of harmful toxins, but also averts formation of cancerous tumors. It has been estimated that about 100g of beetroot gives out 27 percent of folic acid’s RDA. Folic acid is known to prevent birth flaws in babies. Beet greens (raw) have two carotenoids namely zeaxanthin and lutein. Studies have shown that these two carotenoids are quite helpful in maintenance of eye health more so, the retina. Beet greens should be eaten raw because the carotenoids get destroyed when cooked. Drinking beet juice on a regular basis is beneficial in that it cures and prevents inflammations which include acne. It also eliminates blemishes. Beet juice also promotes hair growth and healthy skin. Beet contains iron which is a mineral that helps prevent iron-deficiency anemia. Anemia refers to low levels of RBC’s; the RBC’s are responsible for carrying oxygenated blood and removing waste products like CO2 from the body. Therefore, the iron in beet juice can be used to treat anemia. Beet juice also contains betaine which is responsible for stimulation of liver cell functions. It also protects the bile ducts and liver. What’s more, beet fiber enhances the production of glutathione, catalase and SOD (liver detoxifying enzymes). Beet juice is reported to have excellent healing properties for kidney problems, gallbladder conditions and gout. That’s not all; beet juice also improves stomach acid production, lessens serum cholesterols, lowers homocysteine and regulates blood pressure. Betalain is a color pigment that is contained in beet juice. This pigment is also a potent antioxidant, fungicidal, anti-inflammatory and helps in substance detoxification. Betalain can be found in any beetroot part which includes the flower petals, stem, leaves, roots and fruits. Beets also have low fat and contain vitamins A, B1, B2, B6 and C. The beet greens are said to contain higher levels of iron which help in preventing anemia. Other nutrients that come with beet juice include copper, chlorine, sulfur, calcium, sodium, potassium, bioflavonoids, natural sugar and iodine. Beet juice also provides dietary fiber, niacin, biotin, folic acid, magnesium and carbohydrates. 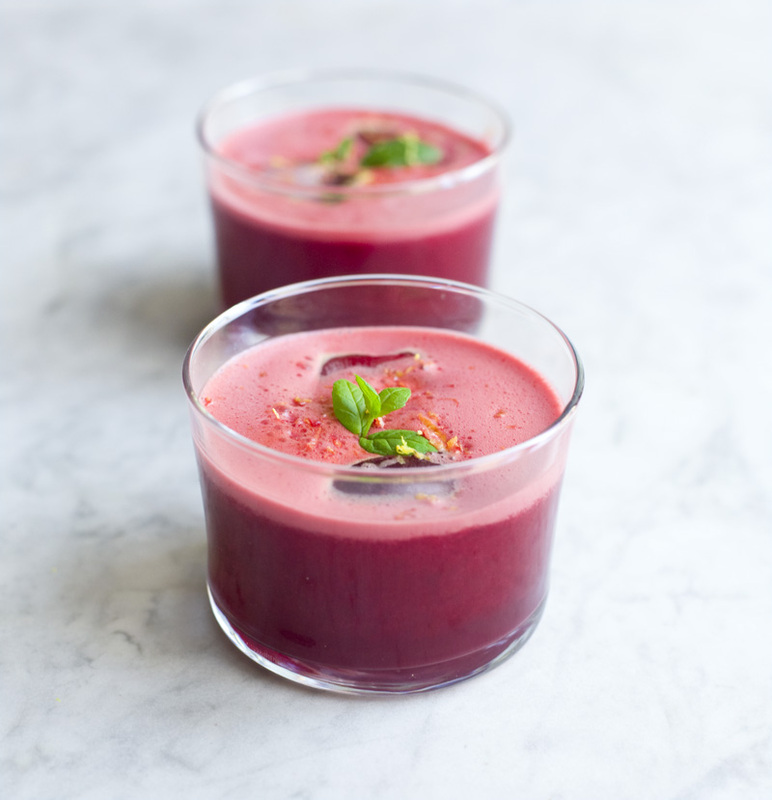 Here are some different beet juice recipes you can try at home. Remove mud or dried dirt from the beets’ surface by properly washing them. Cut them into quarters. You can also choose to discard, or save them and use the greens. Turn the juicer on and have the cut beets pushed inside one at a go until you get the amount of juice you want. Take the beetroot and remove its top. Scrub in well using a firm vegetable brush and water to have all dirt removed. Wash or peel the cucumber. Check to confirm whether the cucumber is waxed. If it’s waxed, it is best you peel it. Take the pineapple and remove its tough skin. Slice it to smaller pieces. Cut all the vegetables and fruits in a size that will fit the juicer. Take a tough vegetable brush and some water (preferably running water) then clean the vegetables. Peel the beetroot and carrots. However, if the beetroot skin is thin, you can just cut the top off. Slice the vegetables to small pieces i.e. pieces that would fit the juicer. Juice the mixture and then serve.